Finance Minister P Chidambaram appealed for calm and requested people not to panic saying that the sharp falls in domestic markets that sent the rupee to a record low were a reaction to global developments after markets crashed on Friday and rupee hit a record low 62 to USD yet again. haha well .. Ecstasy forsure .. comparing with bigger crap to claim this one was smaller 😀 its funny when they not only think but declare that they consider us fools . with such statements they make ..
Yup we are a cool nation, with all Mantris being the coolest. Attack on border…we are cool, Market crashes we are cool!! thanks Sfurti .. indeed we are too cool .. no matter what !! 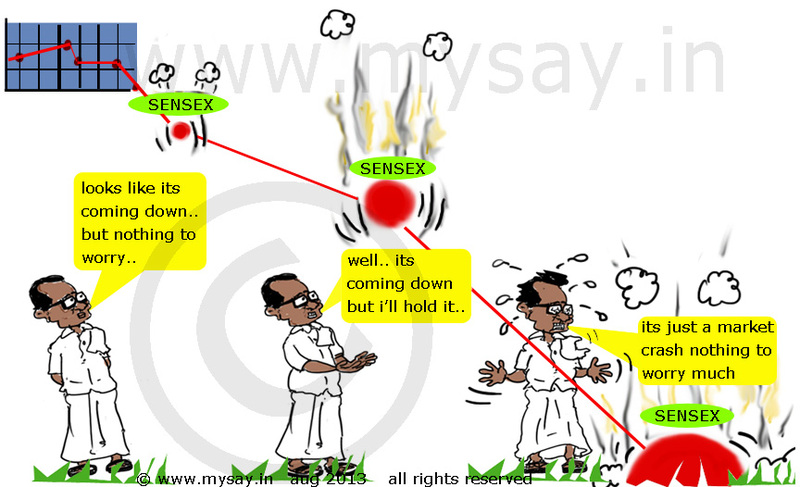 Great doodle… Typical Chidambaram !! All he is trying to do is buy time !! He and his assurances! Hopeless! indeed it is Indrani hopeless forsure !! brilliant one .. even when dollar almost touched 62 and pound closing 95 and onion 100 rs per kg . ..he says why are we worried as if we have the amount of black money they have .. we aren’t lagging behind Zim..
hahaha soon you will find their names … just that they are negotiating the pricing at which they will sell their names for the record 😀 business everywhere 😀 they think ! Indeed you are right they are waiting for the right price for their name..